Drops Arthritis Oil from www.arthritis-oil.com and Singing Bird Inc.
Home > Drops® Essential Oils > Drops Arthritis Oil, 1/2 oz. 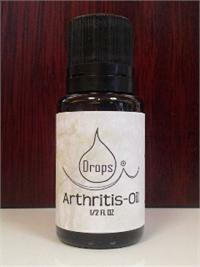 Drops® Arthritis Oil, 1/2 oz. Use Drops® Arthritis Oil daily. May be used directly as a rub or added to your bath, massage oil or lotions. Contains 100% Pure Therapeutic Grade Essential Oils of: Lavender, Eucalyptus, Ginger, Peppermint & Vitamin E.
I have to say this product really worked! My left hip had been aching for at least 7 years maybe more but after about a month or so of rubbing a few drops on it every night it hasn't bothered me again. You guys rock! Thanks again. The comments I found were correct!